I think those actually ended up in Korea as the Vistar-16. Those also have their expansion ports removed. There's no evidence of it ever getting released in Brazil. I think NEC had a factory in Brazil, so they probably shipped them there first to remove those. For what reason? I'd guess for import tax reasons, maybe that enabled them to be classified as toys instead of computers. The PC Engine Shuttle was also released in South Korea in April 1990 by Daewoo as the Zemmix Shuttle, that model doesn't have an expansion port either. Prior to that the original PC Engine was sold there too, supposedly exclusively imported from NEC. So there are Korean shipments to add, maybe Taiwan too as it was also NTSC, but like Sega we don't really have any details about there apart from the fact that there were Taiwanese PC Engine clones and unlicensed software. There was also the PAL Turbografx which NEC manufactured for a holiday 1990 release before deciding not to officially release it due to poor US sales. These were sold to various European distributors such as Telegames, who are still selling them to this day. In France Sodipeng semi-officially distributed the PC Engine since the late 80s, modified for RGB output. These were sold in major retail chains and received national TV adverts. It's unclear if these were imported directly from NEC or not, but it's certainly possible. The Turbo Express was also released in the US in 1990. This book from 1990 states that 1.5 million had been shipped overseas. As for Taiwan and the PAL Turbografx, those have to be tiny numbers. The PAL system was test-market only, they can't have made many. As for that French system, wouldn't that just be PCEs they bought and modified, counted in the Japanese PCE numbers? I can't imagine sales were huge, either. The 20,000 figure sounds like a sold through estimate based on sales of Cosmic Fantasy 2. Selling 1:1 with the hardware does sound like a bit of a stretch. It's not a very solid figure. Still, there could have been more unsold inventory sitting in warehouses. According to this article 25,000 Duos were sold (probably shipped) in the initial test markets of NY and LA. They would presumably have had more units for the nationwide release. So I don't think that those numbers are necessarily wrong when taken in the context of international shipments from NEC to distributors and subsidiaries in North America, Asia, and Europe. In this thread he says that his Saturn RPGs shipped a combined 250,000 copies, while NPD data from old threads linked there claimed they sold only a 91,000. I'd trust him over NPD, if those are the real NPD numbers. Well, the TurboDuo (which is all I cared about, doing CD games and all) sold less than 20,000 units. The add-on TG CD drive was that or less. It was really bad, but for the size we were then, we were regularly selling through to 50% or more of the installed base which is incredible and we'll never match that again. On Exile II it was an issue of limited number of modifications because we weren't doing the game reprogramming, Telenet was. It was a small number of tries. And on the second-to last time, we had it *almost* right, so we added like +1 to the monsters, but it was like that scene with the fat guy in Meaning of Life where the waiter gives him that one wafer and he explodes. That +1 exceeded some limit internally and made the monsters exponentially harder rather than incrementally. Since it was our last "fix" and we had production discs, I thought we were screwed and had made an unwinnable game. Fortunately, with some time and special strategies, we found out you could finish it. We made one of the hardest games ever - by accident. I have previously speculated that this might be numbers sold as of when he stopped supporting the system in mid '93 sometime, so it wouldn't be the final Duo number, but regardless it clearly sold VERY poorly. Goldstar (Taiwan) will launch its 3DO machines in Europe. Goldstar plans to launch the console in France and then Germany later in 1995. The GDO-202P Interactive Multiplayer System offers a double-speed CD-ROM drive, an ARM RISC processor, and two graphics processors with 3-Mbyte memory. It is possible to daisy-chain up to eight consoles. Goldstar exhibited its GDO202P 3DO, of which it aims to sell 50k units by end-1995, the GD1750 and the GBP1300/unit GPI1200/unit portable games unit, at the European Computer Trade Show which also saw launches of games products by Sony and Panasonic. Panasonic exhibited its REAL FZ1 player, of which it has already sold 20k units and the faster FZ10 due for launch in May 1995 for GBP399.99/unit. Sony's Playstation dominated the show on a 1400 sq ft display. GoldStar has cut the price of the 3DO machine by GBP50 only two days before launch on 15 June 1995. The machine was launched at GBP349.99 vs the expected price of GBP399. One reason for the price cut was the reduced price of the FZ1 from Panasonic to GBP349. LG Electronics is shipping 3DO games machines which adopt PAL TV formats for the European market. LG has shipped 6k units to the UK and now plans to ship 30k players to Germany and France. LG management has invested Won350 tril on development of PAL-compatible machines. Goldstar's new 3DO model may not be launched at retail in the UK, with production of the Mark 1 in S Korea said to have stopped. According to Goldstar Europe, the GDO 203P, a cosmetically upgraded machine, has a styling similar to the Panasonic FZ-10. Goldstar declined to comment on whether 3DO model output had ceased. The new casing may simply be exchanged for current stocks. Even with the cessation of production, Goldstar will still market the Mark 1 3DO in 1996. LG Electronics (Seoul, S Korea) has announced plans to stop sales of Goldstar 3DO software and consoles once current stocks have run out. The company's decision follows its failure to agree terms with Matsushita over licensing of the M2 next generation 3DO technology. LG Electronics may eventually decide to sell its equity stake in the 3DO company. So Goldstar 3DO only seems to have been sold in UK (June 15, 1995), France, and Germany (October 1995) as far as Europe is concerned. Probably no more than 50k shipped for Europe before they discontinued production, releasing 3DO Alive II only in South Korea (December 20, 1995). Presumably sales were higher in South Korea and the US where the first model released November 1994. Cd-I took around 3 years to sell 1 million units. Another interesting fact is the consumer side was the side they messed up on. In 1995 Philips reported one million units in Sept. In December they stated they sold 350,000 units on the for Consumer players. But apparently that number is less than what was sold to businesses/private/contracters/and schools. and it also represents a regrouping forces, noted Gray. "We absolutely are not abandoning the consumer side. Some 350,000 U.S. consumers own CD4 machines and, based on a recent survey we did, they appear to like the product a great deal but their major dissatisfaction is with the software." He blamed that on retailers who will only stock a few top-selling titles. "There isn't enough shelf space. So we've just created a CD-i Gold Club, which is free to CD-i owners and has special promotions and access to all 300-plus titles available on CD-i. We also want to develop a secondary catalog of non-mainline Philips CD-ititles." Gray said his survey also uncovered two distinct buyers, rural and urban. The former tends to treat the CD-1 machine as a family entertainment and education tool while the latter treats it more like a traditional video game machine. "The product has been more successful in Middle America, which has been buying it as an all-round education and family entertainment system. As a result, we see the smaller retailer having much more success selling it rather than the Best Buys and Circuit Citys. We may decide to go with more focused programs on an exclusive basis with certain chains, but it will be up to the individual retailer. We won't physically pull it back from any active channel." Gray said next year he will be looking to do some different things with CD-i such as adding an Internet browser. He's also looking into karaoke applications, with the young female audience in mind. Seems like the machine had the wrong focus. They kept trying to get into the consumer market and ended up getting nowhere. it's funny because the 3DO had a similar rpoblem except the groups were different, 3Do was trying to be a multi-media player like the CD-I but couldn't pull it off because it ended up to gaming, and ended selling around 2-3 million units, if they shifted focus earlier they would have had a pretty great selling game machine. That says 350k just for US, not worldwide. I remember seeing CDi in a department store when it first came out, it was displaying a golf game with a trackball. It was really expensive and the standard "controller" (more like a remote control) was really clunky. It was designed and marketed more as a multimedia machine than a console, with software such as encyclopedias. I found it incredibly unappealing. A couple of years later they released a more console focused version with proper controllers, but by that time it was dated compared to PlayStation and Saturn. Commodore tried something similar with the CDTV, but the expected market for dedicated multimedia machines never materialised, and was supplanted by multimedia PCs. You're right, however as indicated by Gray, that was the lesser number, they sold more to schools/business/etc, than general consumers. The sales number described also makes it seem like U.S. was the strongest market for the CD-I. Net sales in 1993 were $28.8 million as compared to $127.3 million in 1992, a decline of 77%. Sales declined significantly as the Company downsized, closed operations and changed its product focus. Sales of the Jaguar product line began in the fourth quarter of 1993 with approximately 17,000 console units shipped which, along with related software sales, resulted in $3.8 million of Jaguar product sales in the quarter. Net sales for the year ended 1994 were $38.4 million as compared to $28.8 million for 1993, or a 33% increase. The increased sales were primarily a result of the Company's national rollout of its new 64-bit Jaguar entertainment system and related software. Sales of the Jaguar represented 77% of total sales in 1994 as compared to 13% in 1993. The Jaguar was launched into two markets in late fall of 1993, and approximately 100,000 units were sold by the end of 1994 at a suggested retail price of $249.99. In the first quarter of 1995, as a result of its research and development and manufacturing process efforts and competitive analysis, the Company reduced the wholesale selling price of Jaguar enough to allow retailers to sell it from $149.99 to $159.99. This price reduction will make Jaguar very competitive with older-technology 16-bit systems currently being offered in the market today. In addition, the Company is presently publishing approximately 20 Jaguar game software titles. Sales of Lynx (a portable hand-held video game), Falcon 030 computers and other older products represented 23% of sales in 1994 as compared to 87% for 1993. From the introduction of Jaguar in late 1993 through the end of 1995, Atari sold approximately 125,000 units of Jaguar. As of December 31, 1995, Atari had approximately 100,000 units of Jaguar in inventory and the value of Jaguar inventory and related software was approximately $9.9 million. Due to disappointing sales of Jaguar and increased competition from products introduced by Sega and Sony, Atari reduced the suggested retail price of Jaguar to $99.99 and recorded an inventory write-down of $12.6 million in 1995. There can be no assurance that Atari's substantial unsold inventory of Jaguar and related software can be sold at current or reduced prices, if at all. In addition, any further decrease in the value of such inventory could result in substantial additional inventory write-downs by Atari. Atari has placed no manufacturing orders for the Jaguar console since mid-1995. Based on current and expected sales and inventory levels, Atari does not intend to pursue additional Jaguar manufacturing. The Jaguar console unit was assembled in the United States by a third-party subcontractor under a manufacturing arrangement. The agreement may be canceled by either party with 90 days' notice. Jaguar software products and accessories are manufactured by several suppliers and are assembled by subcontractors. Atari believes that it could readily replace these sources of supply and assembly, if necessary. Thanks to JumpingRyle we have shipment data for Sega consoles (MD, MCD, GG) prior to March 1992. 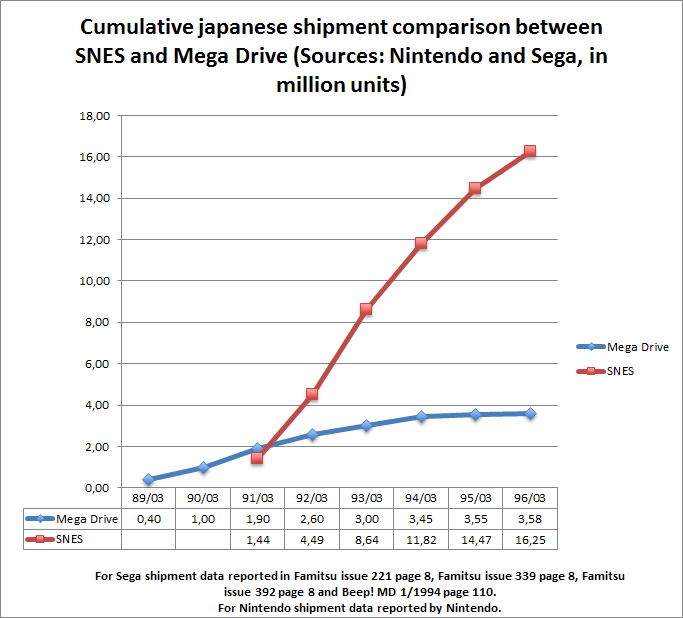 There are some discrepancies with the LTD reported in Famitsu 221 but maybe they could be explained if Sega used for one consolidated shipment and not-consolidated shipment for the other. 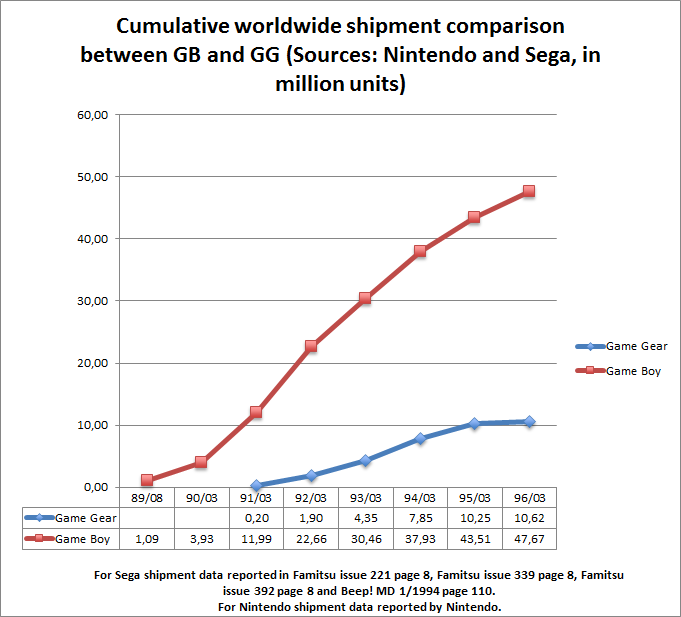 Keep in mind that data for the fiscal year 93/04-94/03 should be Sega forecast and not actual shipment data. 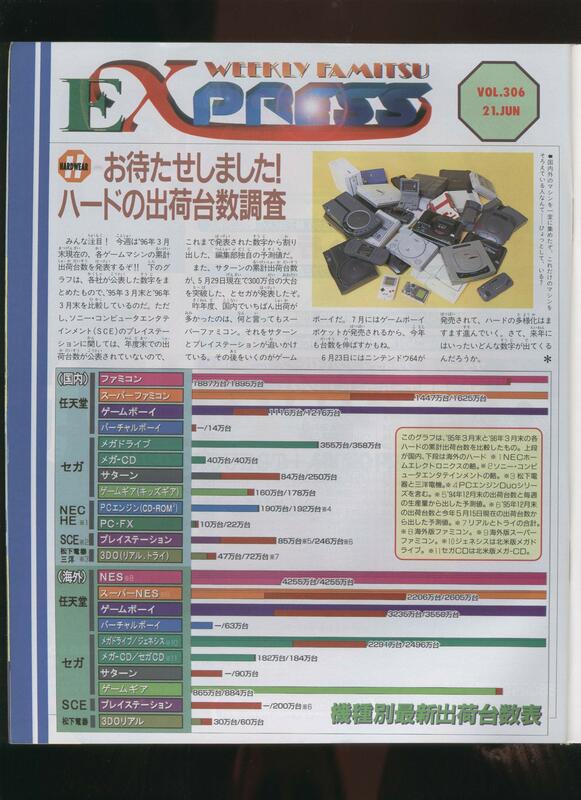 Shipment data by Sega as reported from 1/1994 issue of Beep MD (Page 110, published in 01/01/1994). This sales data comes from Sega. 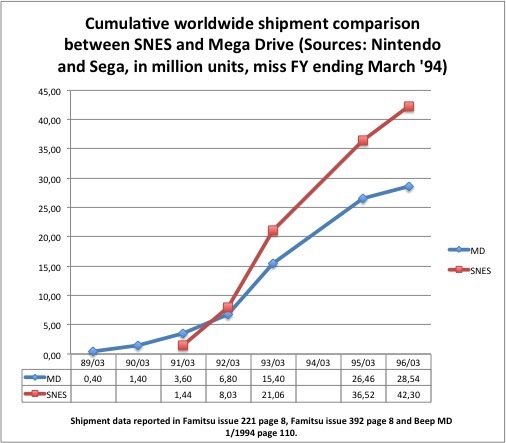 The data for FY '93 is an estimate (made by Sega) since the magazine was published 1/1/94. The white bars are Japan, the grey America, and the black Europe. MD/Genesis is top left and GG is bottom right. 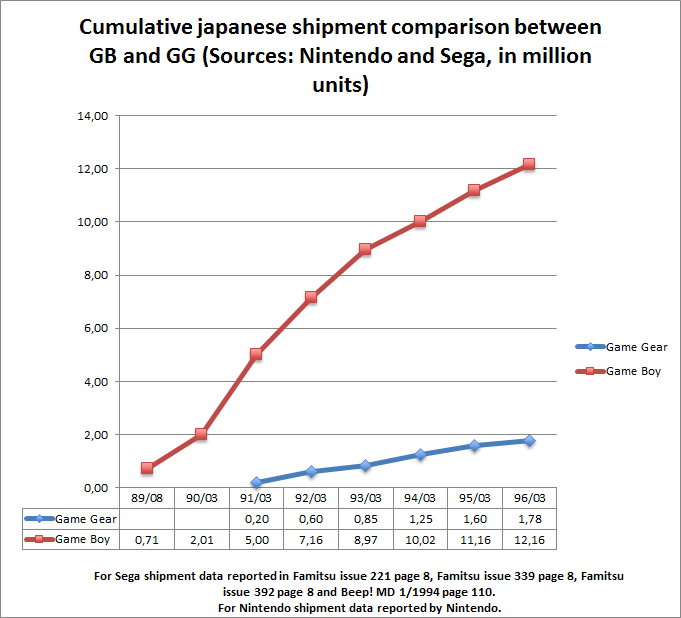 The numbers generally agree with the Famitsu 221 numbers. 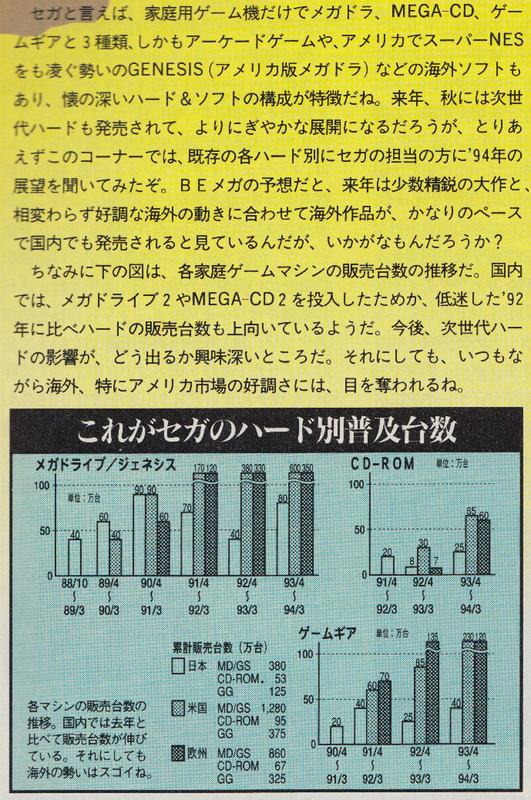 However, there are small differences: LTD for FY '92 are 7.4 million rather than 6.8 as in Famitsu. And the LTD for FY '93 are 14.9 rather than 15.4. But close enough. The numbers for FY '93 are estimates (probably made pre-Christmas) and obviously seem too high. Keep in mind that I believe the discrepancies with MD LTD in '92 and '93 between Famitsu and Beep MD are due to different accounting methods thus what I'm doing here for MD is a trick (I'm putting together "apples with oranges"). Seems to translate as "End of April 1995, Sega end production of Mega Drive, Mega CD, and Super 32X and announce the final shipment totals; 3.58m, 400k, and 50k respectively". Clearly this announcement was only for Japan, as they made a different announcement for the West the following year. Which makes me wonder if Game Gear was actually discontinued in Japan at the same time as the west. Two days before the end of the year ending March 1996 Sega released a new model of Game Gear (Kids Gear) in Japan and continued to support the machine throughout the year with new releases (which also had the Kids Gear branding). This source whilst being off on the early Game Gear numbers match known numbers for FY95 (350k), and FY96 (180k), and then gives a number of 100k for FY97. That's a dodgy source considering some of the earlier numbers, but I'll keep an open mind for now. 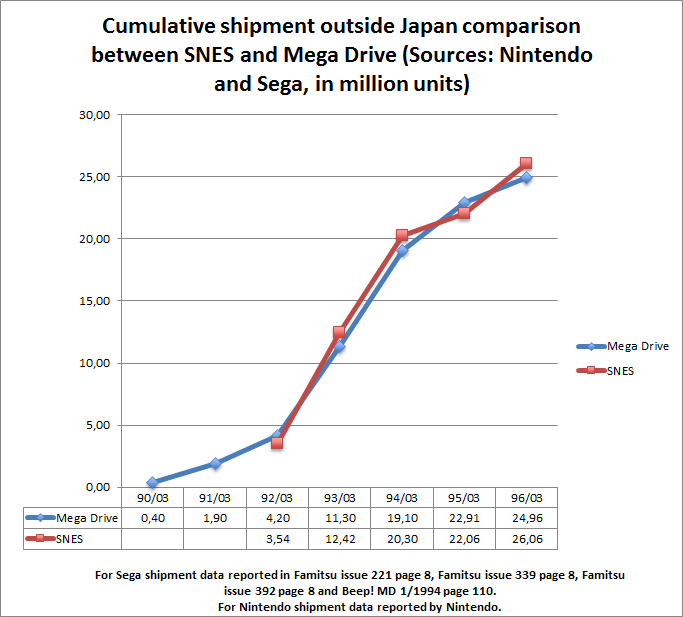 Total Japanese Mega Drive, Saturn, and Mega CD shipments for the year ending March 1995 were 960k, which is 50k less than Sega's home console hardware shipments reported by Nikkei, so that seems to confirm 50k for Super 32X in Japan. Seems to translate as "December 7th, 2001; Final domestic shipment of Dreamcast. After being discontinued it had seen increased sales due to a price reduction and since September they have shipped more by rapidly converting 20,000 units of overseas stock to Japanese specifications." Which if my translation is accurate (feel free to correct if not) seems to confirm that overseas stock was re-allocated to Japan. The only overseas stock Sega had at the time was for the U.S., so that total should be a little lower, and Japan a little higher. Sega were initially forecasting 170k Dreamcast for that year in Japan, with 760k for U.S. based off of remaining inventory. They never reported the final shipments for the year ending March 2002, but Nikkei reported 200k for Japan, so that seems to explain where the 30k difference came from (admittedly it only explains 20k of it, but it seems reasonable to suspect that they decided to convert a few more US units following the reported initial 20k. This source which agrees with the 200k even says a further 6k were shipped in Japan the following FY, but we don't have Nikkei's report for that year. Only 2.24m for Sega CD, I thought sold much more. It still isn't that bad and had a pretty strong start (mostly due to Sonic CD and a few other games later) not much on there later on to push the hardware. Very cool, the MD JP numbers match with unconfirmed numbers I already have. So LTDs through March 1992 agree apart from MD EU, where there is a significant difference (600k). Note that Famitsu MD EU LTD (1.2m) is the same as Beep! MD EU YTD, so maybe that is an error in one or the other. The Famitsu article also has errors with some of the Nintendo numbers, so that article could be considered possibly less reliable. This is a bit more of a mess. Some of the difference can be explained by Beep! rounding to the nearest 50k, whilst Famitsu rounds to nearest 100k (both round to nearest 10k for Mega CD due to low shipments). 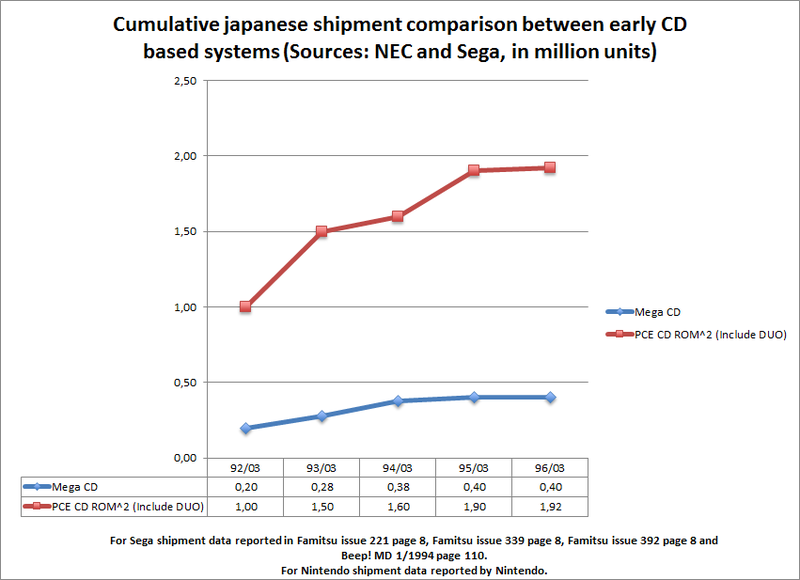 Taking that into account Famitsu has international MD shipments higher than Beep! for both US (200k) and Europe (900k), although 600k of the EU difference could be explained by an error with the LTD from the previous year. I guess we need the Famitsu Express shipment report for the following year to get a better idea of what happened here, but I'd be inclined to go with Beep! numbers for now as they came out long enough after the end of the FY for them to have the same type of data (consolidated / non-consolidated / production shipments) for FY92/93 as the other years, where as Famitsu's report came close to the end of the FY so may only be using whatever data was available for the previous FY which may not have necessarily matched the data that they used for the previous LTD.
Yeah, I would like to get the Famitsu Express report for 1994. I'm fine on taking Beep MD data, will update the graph later. Just a random guess though. The difference in Europe (Other/PAL) is too big to be explained by rounding. Famitsu has a higher LTD for EU: 300k and US : 200k than Beep! so that can't explain it. I doubt that Japanese magazines would have access to TecToy's shipment numbers, they were pretty independent of Sega, manufacturing whatever they wanted. Brazilian magazines don't seem to have much on their shipment numbers at any rate. I'd guess that it's more likely that Sega only had international production shipment numbers available when Famitsu went to press. I have a suggestion for the OP in this thread (of course when you have time/will to do it). 1) to have the sources for the data in the OP or just under it. I'll do that at some point. With the Beep! data we can now see that all known Sega data matches this chart from FY starting April 1991 onwards, which is the year that Sega changed to FY running from April-March. The older Sega numbers disagree as presumably they cover different time periods. 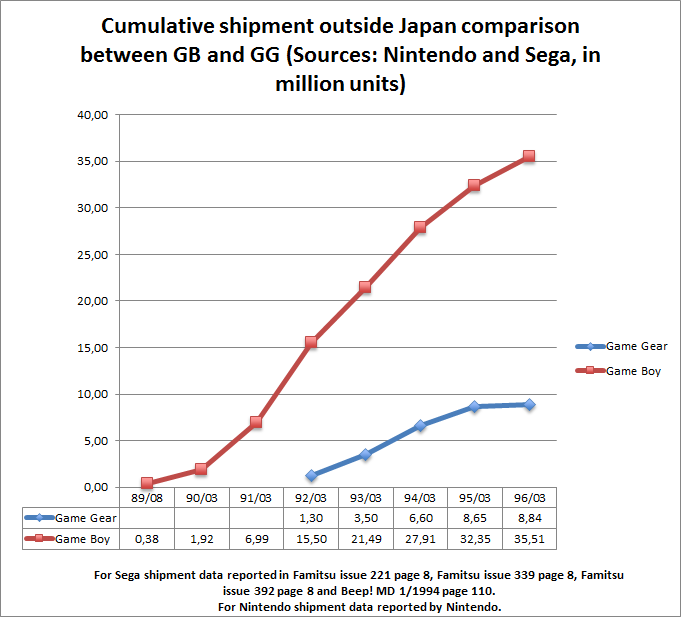 This suggests that Game Gear may well have shipped a further 100k in Japan during the FY ending March 1997. What does it say in the parenthesis? We need some Japanese speakers in this thread. I can only really read a few basic things such as "ten thousand units" and console names. The article seems to talk about Duo-R releasing 20,000 Yen cheaper than the Duo, and at the end of last year (I guess FY going by known numbers) CD-ROM² shipments had hit 1,000,000 units. 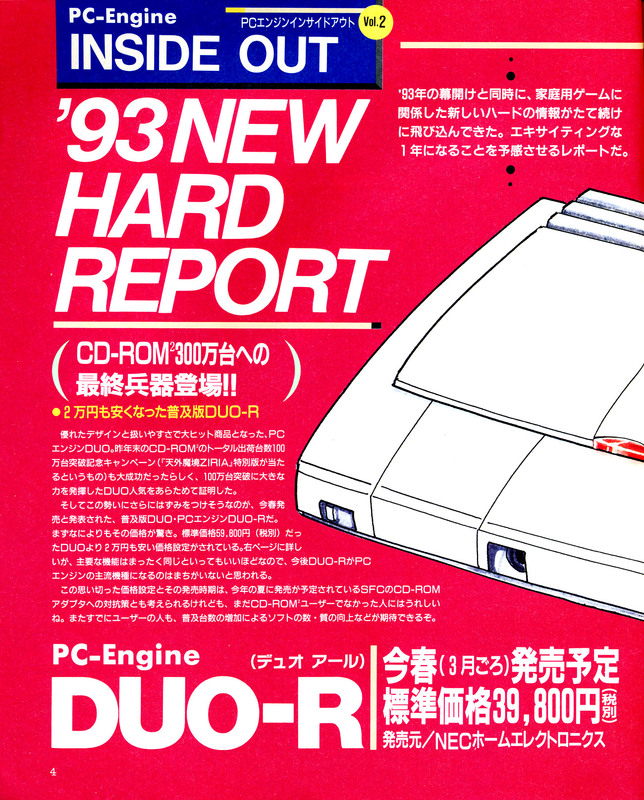 So my take is that the cheaper DUO-R is expected to help sales of CD-ROM² to reach 3,000,000 units. Optimistic if my pseudo-translation is correct, but need a Japanese speaker to confirm. This was the preferred method of Sony (and possibly other electronics companies such as Matsushita/Panasonic) until March 2007 when they switched to Consolidated Shipments. These are shipments of consoles from the factory, but not necessarily to subsidiaries, distributors, or retailers. They could be stored in warehouses for example. Whilst this method of accounting is accurate, it may not necessarily reflect demand at the time, especially for "failed" systems where large stocks of unsold hardware eventually gets liquidated through large discounts quite some time after manufacture. This was the preferred method of Nintendo and Sega for their overseas sales until March 2000 and March 2001 respectively. These are shipments of consoles to subsidiaries and distributors, but not necessarily retailers. This method of accounting is also accurate, and is a reflection of demand at the time from subsidiaries and distributors. For more details of non-consolidated and consolidated shipments see here. This is the current standard, adopted by Nintendo, Sega, and Sony from April 2000, 2001, and 2007 respectively. Consolidated shipments, also known as "Sell in" are shipments from subsidiaries and distributors to retailers. As with the other accounting methods mentioned above this offers accuracy, but is also a better reflection of demand at the time as it directly reflects retail demand. These are sales from retail to consumers, and theoretically offer the best reflection of demand at the time. Unfortunately these are estimations for the whole market made by various retail tracking firms (and sometimes the manufacturers themselves). Whilst achieving a decent level of accuracy today this hasn't always been the case in the past, where they may have missed large parts of the market. For example GfK Lek Trak in the UK were a consumer goods tracker who didn't cover specialist game stores or toy stores. Conversely the American NPD Group's Toy Retail Sales Tracking Service (TRSTS) tracked toys, and may not have had coverage of consumer electronic retailers. These trackers also only tracked a limited number of retailers, missing large players such as Toys R Us and Walmart. For these reasons this method of tracking is not considered accurate. For the purposes of this thread shipments will be considered as "official" numbers. Whilst the three different shipment accounting methods can result in somewhat different numbers at any moment in time, they should all eventually converge on the same lifetime number. One rare exception is when excess stock is unable to be liquidated and is destroyed. In this specific case production shipments would be higher than either non-consolidated or consolidated shipments. Where more than one shipment method is available the priority will be "Consolidated Shipments" > "Non-consolidated Shipments" > "Production Shipments" to better reflect demand at the time. I've bought some May/June 1994 issues of Famitsu, hopefully one of them contains the 1994 hardware report. It will at least narrow down the issue that does contain it if not. 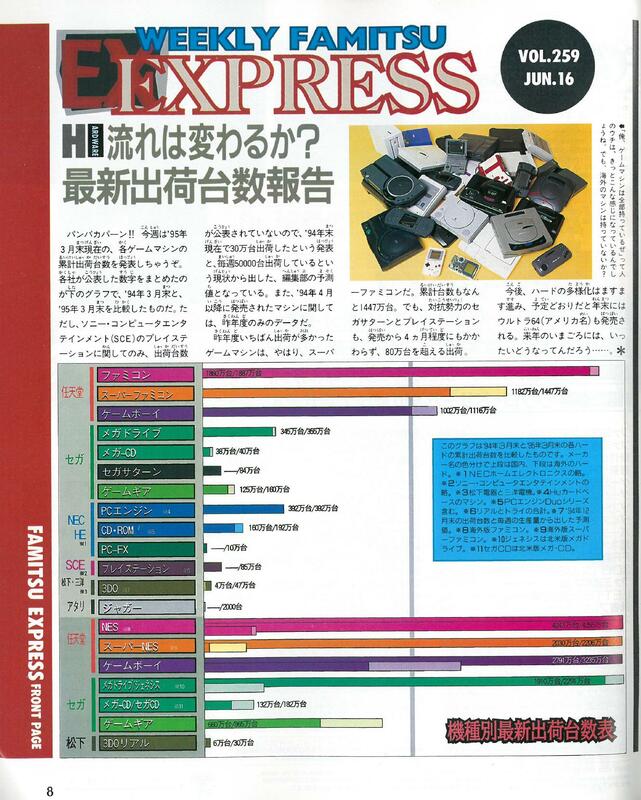 Japanese shipments through March 1997, same numbers as Edge article previously posted, but with a breakdown of Neo Geo and Neo Geo CD. I think that's just rounding, up to 1997 they just round to 100k, then they round to 10k from 1997/09. Brazilian magazine "Super Game Power", October 1995; Master System "over a million sold in Brazil". Interview with Tec Toy's Stefano Arnhold. Stefano Arnhold finished by speaking about their peak, "In 1993 the company went public with shares traded in the Sao Paulo Stock Exchange and we also introduced PC Games. In 1994 our Sega Club reached 200 thousand active members (the Club now has more than one million members) and in 1995 we introduced the Sega Saturn. In 1996 we reached the mark of 2MM consoles sold and our hotline was answering 50 thousand calls a month. Over the next year we entered the internet market as a full internet and content provider under license from Compuserve. In 1999 Dreamcast was introduced." Magazine (don't know which, maybe "TBM"?) 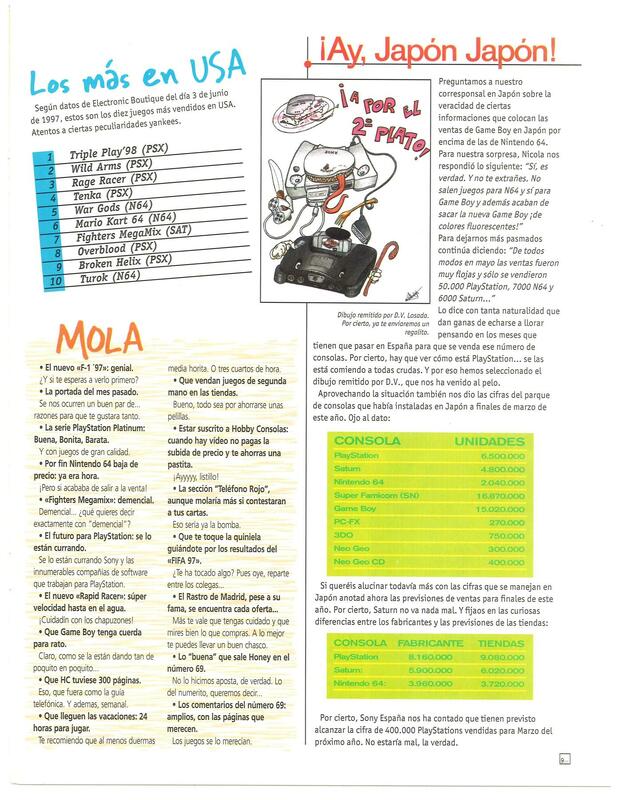 article from 1997 with official Brazilian sales supplied by the manufacturers. PlayStation not included as there was no official distribution. 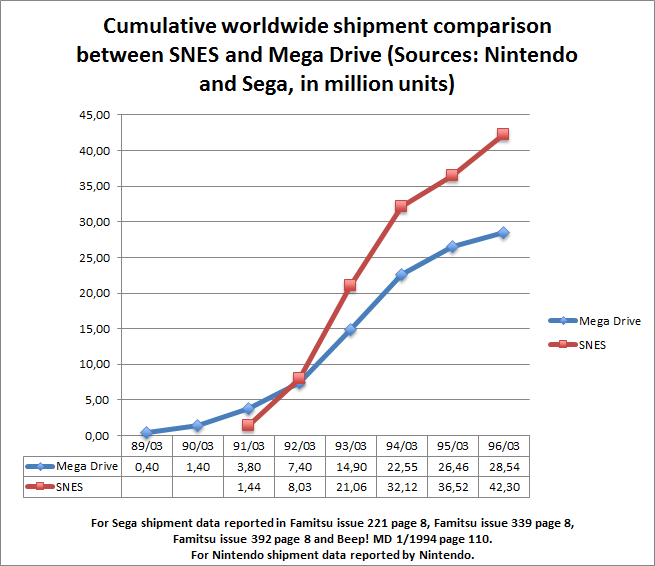 So, Mega Drive only sold 350k in 6-7 years, I guess clones affected sales as the uncloned Master System would have made up the bulk of those two million consoles sold by 1996. Mega Drive was supported until 2002 in Brazil, when they stopped making games for it and started releasing models with dozens of games built in. They started doing the same with the Master System in 2002, which had "Brazil's most successful console" on the box, so the Mega Drive never did become as popular as the Master System in Brazil. I'd be suprised if adding up all the non-Sega manufactured models released (the bulk of which would be TecToy; Brazil, and Samsung; South Korea) whilst the system was still being supported would even reach a million (not including Majesco). 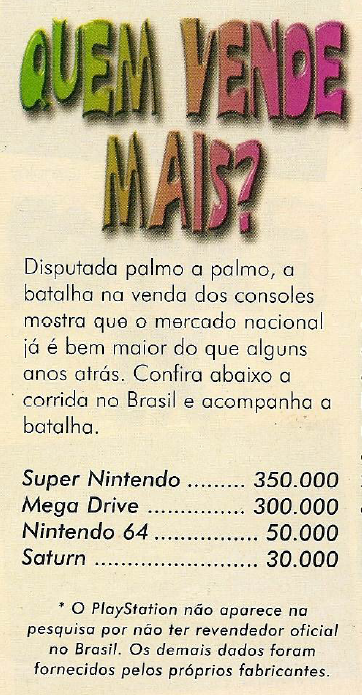 Super Nintendo outsold Mega Drive in Brazil? I wrote this some time back but seem to have not posted it. Fortunately I still have the text. It's actually relevant -- some unreilable Brazil MD numbers are linked. Ah. Yeah, only that super-unreliable Gamepro article. Checking on ebay Nomads are fairly easy to find, though, so it must not have sold sell terribly. As for the Genesis 3 number, fortunately Wikipedia links the "1.5 million" article: http://archive.today/0y39 That's a MUCH better source than that Nomad article, for sure. Wikipedia's TecToy source: http://jogos.uol.com.br/ultimas-noticias/2012/07/30/vinte-anos-depois-master-system-e-mega-drive-vendem-150-mil-unidades-por-ano-no-brasil.htm 3 million Genesis and 5 million Master System includes those modern clones, of course, so determining how many were in the '90s would be tough, though if that post I linked earlier that says that TecToy's website (once?) said "2 million [probably of both] by 1996" is accurate, a lot did sell later on. 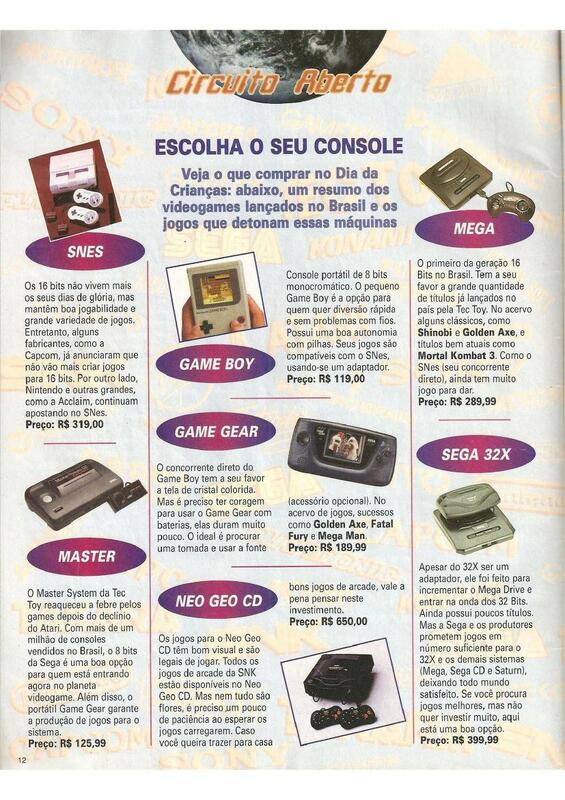 For both US Genesis 3 and Brazilian Tec Toy sales, this website: http://gamehall.uol.com.br/site/a-historia-do-mega-drive/ claims "around 2 million" for the Genesis 3 and 2+ million for Brazil TecToy sales, but a lot of it's probably just a Portugese rewrite of Pettus's SegaBase stuff maybe with some additions for Brazilian-market stuff, with the Brazil number being that from the TecToy site of course. That's all I can find for mentions of 2 million. The problem with TecToy Genesis numbers is that most sources include newer clones, not only systems which can play cartridges. I think there is a good chance I can get the Famitsu report for '95 (which usually contains the previous year shipment data too) if there is any need. If you can get the '95 report that would be great, these cost a lot in shipping once you get past 2 kilos (5 issues just put it over the edge ). 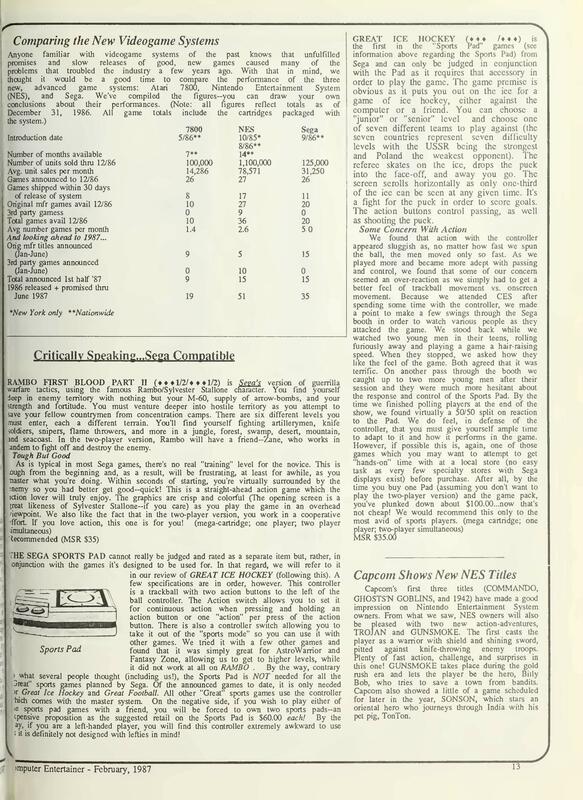 We also have the official sales reports for the Atari 7800 from 1986 to 1990 (thx to Curt Vendel at atariage). LTD Sales: 3.772.700 (as of December 1990). I have huge respect for Curt and Atariage. That said, don't trust any Jack Tramiel period Atari documents for accounting. Their internal accounting doesn't collaborate at all. Jack would even keep different manufacturing and assembling functions of Atari in the dark about what was going on in terms of quantity, and sales. You start pouring through the documents and you stumble on times that they would sell more than they made. The truth is, nobody at Atari, except maybe Jack, was sure how many they were making and how many they were selling of anything. When Sam Tramiel took over, accounting data got a lot more reliable but only for a brief time. After Sam had a heart attack and Jack came back, everything went out the window again. 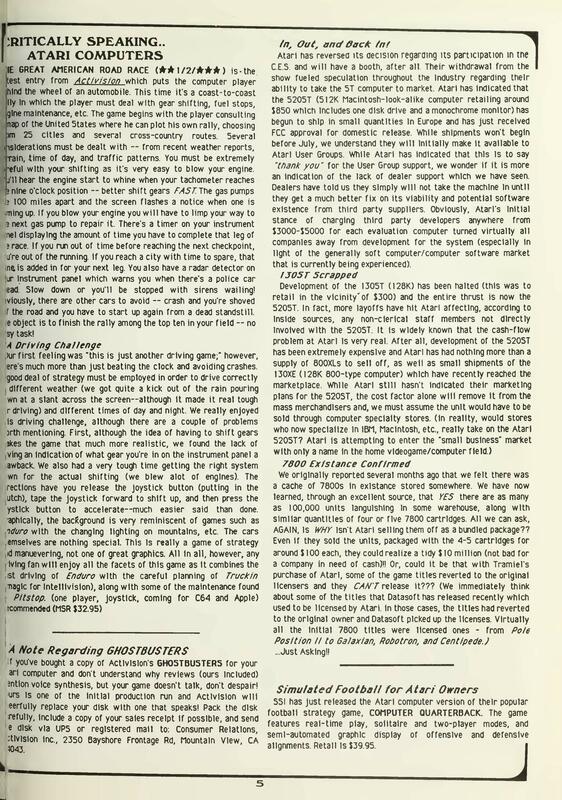 Right, Computer Entertainer reported in June 1985 that Atari had 100,000 7800s stored in warehouses. An Atari spokesman citing manufacturing problems said they had made and sold 100,000 in 1986 (including those old units stored in warehouses from 1984). Quite some manufacturing problem, I wonder if any 1986 units even exist. They expected to sell "five times, maybe seven to eight times that amount in the coming year". 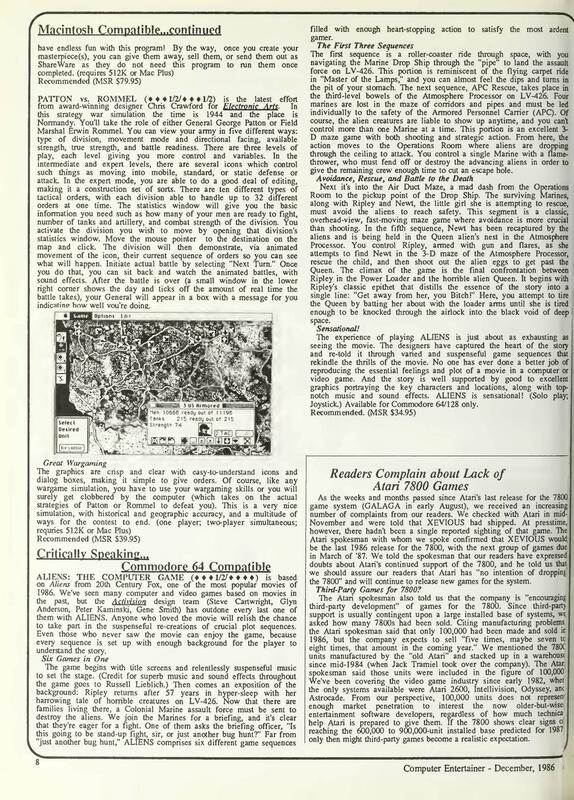 They then proceeded to release practically no games for the next year (which gets mentioned a lot in this publication), with coverage for NES and SMS far outweighing 7800. Still, the Atari shipment data says that they sold 3x what they had made through 1986, and a further 1.3 million in 1987 (despite releasing no games for it). 1.6 million LTD through 1987 is completely implausible (to put that into perspective that's possibly more than SMS sold throughout it's whole life in the US). It can't be explained by overseas sales either, 7800 didn't launch in Europe until holiday '89. As for sales vs. the SMS... well, searching right now, there are more 7800 consoless for sale on ebay (North America only) than SMSes, and I've probably seen SMS consoles less often than 7800s, in person. You do see SMS games a lot more often than 7800 ones, but I think that's probably because 7800 owners bought a lot of 2600 games. Sadly enough, considering how much larger and better the SMS's game library is, I would guess that the 7800 really did outsell the SMS in North America. In Europe of course I'm sure it was a different story. I did say "practically", in over two years following the May 1986 shipping of the console they shipped just five more games. Computer Entertainer is great for this, they have a monthly updated release dates page where they also note which titles have already shipped as of going to press. Unfortunately it's only scanned through 1989. I have data for the US for PSX, DC, N64, GBA and some PS2, Xbox and GCN games from the old sales age days if anyone is interested. Some of those dates are interesting; I thought that Atari launched no new games in '86 other than the titles which were already announced in '84 -- that is I'd thought that they just released everything at launch, then had no new game releases until '87. But there it shows Galaga and Xevious releasing in alter '86. Huh. I guess that's possible. Also, I really think that Desert Falcon was an '87 release, not '88. The same goes for Summer Games and Winter Games. The cartridge, box, Atari Age listings, ingame title screen date, etc. all agree on this for all three titles. Some 7800 games do have one date on the cartridge and a later date on the box, or multiple releases (all of the '86 games also have more common re-releases in '87 and '88 that get rid of the spring-loaded cartridge port protectors, for instance, that claim box and cart dates of the re-release year, not the original version) There are some similar cases you list in '89 but look like 1988 releases, as well -- Crack'ed, Dark Chambers, Donkey Kong, and Donkey Kong Jr. all entirely report as 1988 releases (box, manual, cart, and ingame title screen), not 1989. Magazines could be reporting late? Regardless, that isn't a complete release list -- even leaving out 1990 (when the system got Ikari Warriors, Ninja Golf, Fatal Run, Alien Brigade, Planet Smashers, Motor Psycho, Mat Mania Challenge, Scrapyard Dog, and Midnight Mutants -- unless a few of these released in '89? Some are those with '89 dates on the cart and '90 on the box...), you're missing some games on that list -- Impossible Mission ('87), Ballblazer ('87), Hat Trick ('87), RealSports Baseball ('88), Super Huey ('88), Tower Toppler ('88), Basketbrawl ('88), Barnyard Blaster ('88), Xenophobe ('89), Jinks ('89), and all of the third party releases of course (they're all from '88 and '89, from Absolute, Activision, and Froggo). The '87 library looks a lot better with the 3 games dated to that year you don't list and the five games that claim to have released that year included. Lots of games were delayed multiple times, they can be copyrighted one year but not be released until the next. Desert Falcon date for example kept getting pushed back and back (actually pretty much all 7800 games did too). Dates aren't very well documented, most sites just use the box copyright date, which isn't necessarily the same year as release. I agree that 7800 dates are tricky and frustratingly unclear, but I wasn't just going by box dates there, I was looking at box, cart, and title screens and using the latest date any of those say. Yeah, some games do have multiple dates (box '90 and cart/title screen '89, for instance), I listed those in my last post in the later year in those cases. Here's an article from June 1988, you can see that many of the supposed 1987 releases were planned for release during the second half of 1988. Unlike their previous CES showings, Atari's display at this show included only video games, with not a computer or piece of computer software in sight. (For all the videogame emphasis in Atari's booth, personnel present when we visited seemed remarkably uninterested in press coverage of their games. We ended up giving ourselves a selfguided tour.) 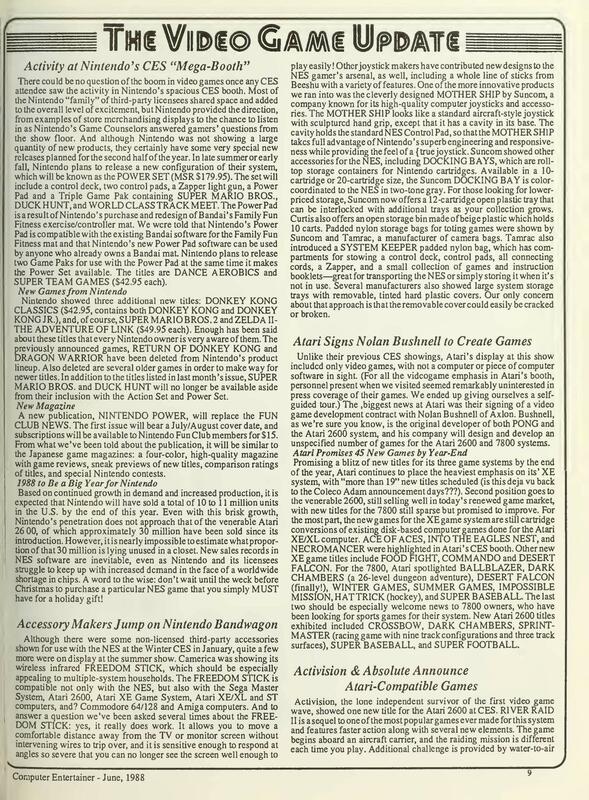 The .biggest news at Atari was their signing of a video game development contract with Nolan Bushnell of Axlon. Bushnell, as we're sure you know, is the original developer of both PONG and the Atari 2600 system, and his company will design and develop an unspecified number of games for the Atari 2600 and 7800 systems. Promising a blitz of new titles for its three game systems by the end of the year, Atari continues to place the heaviest emphasis on its' XE system, with "more than 19" new titles scheduled (is this deja vu back to the Coleco Adam announcement days???). Second position goes to the venerable 2600, still selling well in today's renewed game market, with new titles for the 7800 still sparse but promised to improve. For the most part, the new games for the XE game system are still cartridge conversions of existing disk-based computer games done for the Atari XE/XL computer. ACE OF ACES, INTO THE EAGLES NEST, and NECROMANCER were highlighted in Atari's CES booth. Other new XE game titles include FOOD FIGHT, COMMANDO and DESERT FALCON. For the 7800, Atari spotlighted BALLBLAZER, DARK CHAMBERS (a 26- level dungeon adventure), DESERT FALCON (finally! ), WINTER GAMES, SUMMER GAMES, IMPOSSIBLE MISSION, HATTRICK (hockey), and SUPER BASEBALL. The last two should be especially welcome news to 7800 owners, who have been looking for sports games for their system. New Atari 2600 titles exhibited included CROSSBOW, DARK CHAMBERS, SPRINTMASTER (racing game with nine track configurations and three track surfaces), SUPER BASEBALL, and SUPER FOOTBALL. Seems that this thread is entirely about console sales. Any room for software sales or is that for a separate thread? Feel free to post in here. If you want to post NPD data first would be better to ask to a moderator. Have you seen any of the 7800 stuff you've brought up here discussed at AtariAge, and if so what did they think of it? I know there are people there who know a lot more about Atari history than me. I don't really follow the Atari scene, so don't know what stuff is of significance. It would need someone who knows more than me to go through it. I'm sure that there are lots of cancelled games mentioned. 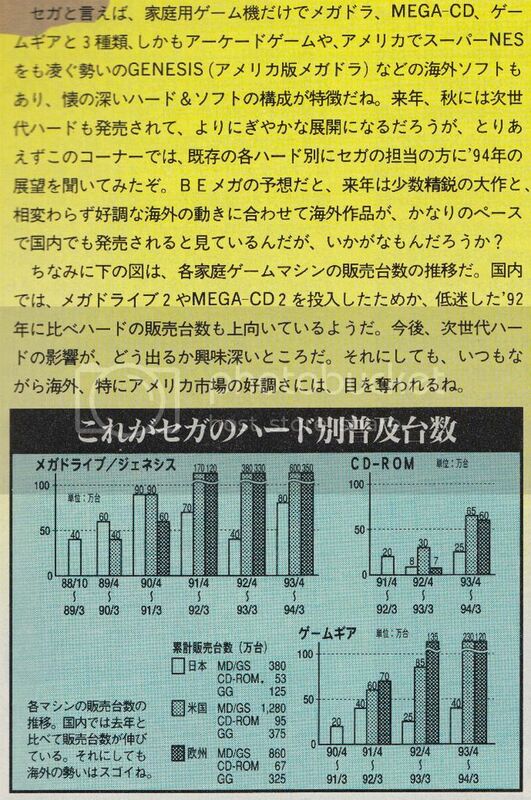 Thanks to Benjamin Stevens kindness we now have the Famitsu article with shipment data for FY ending March '94 and '95 (source: Famitsu Magazine Issue # 339, Page 8, June 16, 1995). So now we have shipment data for the FY ending March 1994 too (with Panasonic 3DO launch)! Also look at the pitiful Atari Jaguar sales in Japan. PlayStation is estimated. Actual total is 0.8m iirc. Meh, no 32X or SMS and international sales are combined. Still, we now have international and worldwide sales for the listed platforms through March 1994 which is good. Maybe they still give SMS and regional breakdown in the '94 report. Typo here, the first should be "PC Engine (Hu card only models). This confirms that the non-CD models stopped shipping in the FY ending March 1994. The chart actually gives a 1.92m figure for Duo for the FY ending March 1995, but the next year's report gives 1.90m for the FY ending March 1995, with 1.92m for the FY ending March 1996. Either a typo on Famitsu's part, or NEC had already finished production and gave final production figure to Famitsu. As other sources agree with Famitsu's '96 report I'll use the latter's figures. No breakdown of CD·ROM² and Duo shipments, I guess they had already stopped shipping CD·ROM² same as PC Engine. Maybe there's a breakdown in the '94 report. Cool, International 3DO REAL launch shipment. Meh, no 32X or SMS and international sales are combined. I can confirm the Jaguar received just the first shipment in Japan (it was distributed by a small company) and was quickly discontinued there. I did write the Jaguar number wrong it's 0.002m (just 2K). Nintendo hardware shipment data from 1983 to 2013. 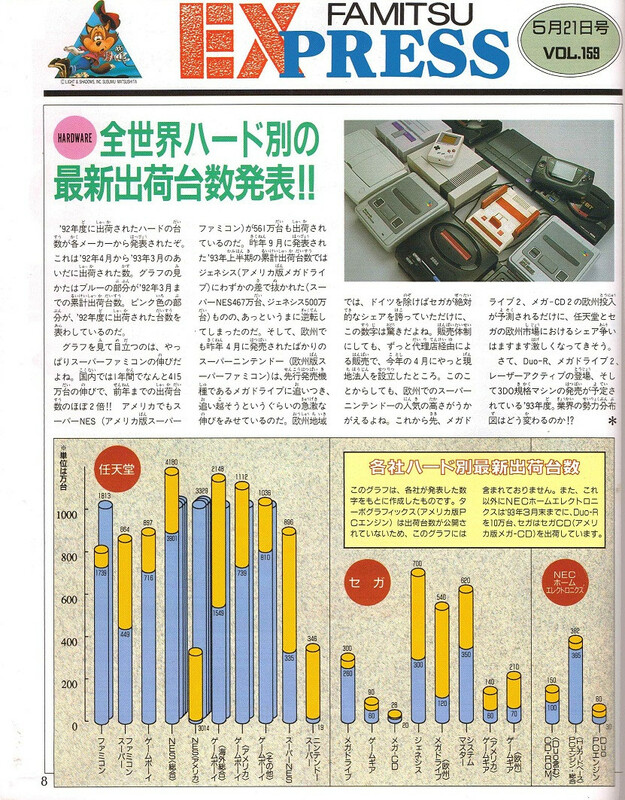 Shipment data by Sega for fiscal years ending 89/03, 90/03, 91/03, 92/03 and 93/03 as reported in 1/1994 issue of Beep! MD (Page 110, published in 01/01/1994). Shipment data for fiscal years ending 92/03 and 93/03 in Famitsu issue 221 page 8. Shipment data for fiscal years ending 94/03 and 95/03 in Famitsu issue 339 page 8. Shipment data for fiscal years ending 95/03 and 96/03 in Famitsu issue 392 page 8. That was Mumin Corp., they also distributed the Lynx. They would later merge with Sega. It's likely the report for FY ending March 1994 is in 287 issue going by when the reports for 1995 and 1996 came out. Now my main interest shifted to 1997 and 1998. Yahoo Auctions. Yeah, I thought that it would be in the missing issue when I ordered them too I haven't seen the supposed 1997 issue come up yet. If they had a report in 1998 then it's probably in one of the magazines in this lot (issue cover dates 1998&#12539;5&#12539;8/15&#65374;1998&#12539;7&#12539;17).